Over the past twenty years, light-workers have been dedicated to raising the vibration of the planet. Birthing the New Earth. In 2004 I was gifted with a vision of a Template of Oneness, the Diamond of the Dove. In 2009 I received the knowledge of how to use the Template as a light body template to connect us with the Earth’s new vibration from the crystalline core of our planet and the Earth’s electromagnetic field. In a vision in 2009, I was taken to the place where these Geometries and Glyphs reside. Golden three-dimensional forms vibrating in space. Profound love surrounded them. Since that experience, I have been gifted with the ability to access this realm to channel each person’s individual Soul Signature as a Sound Code of Light. Soul Signatures hold the key to activating the next directions for your Soul Path for this current lifetime. Clarity can occur on what your role is at this time and into the future beyond 2012. 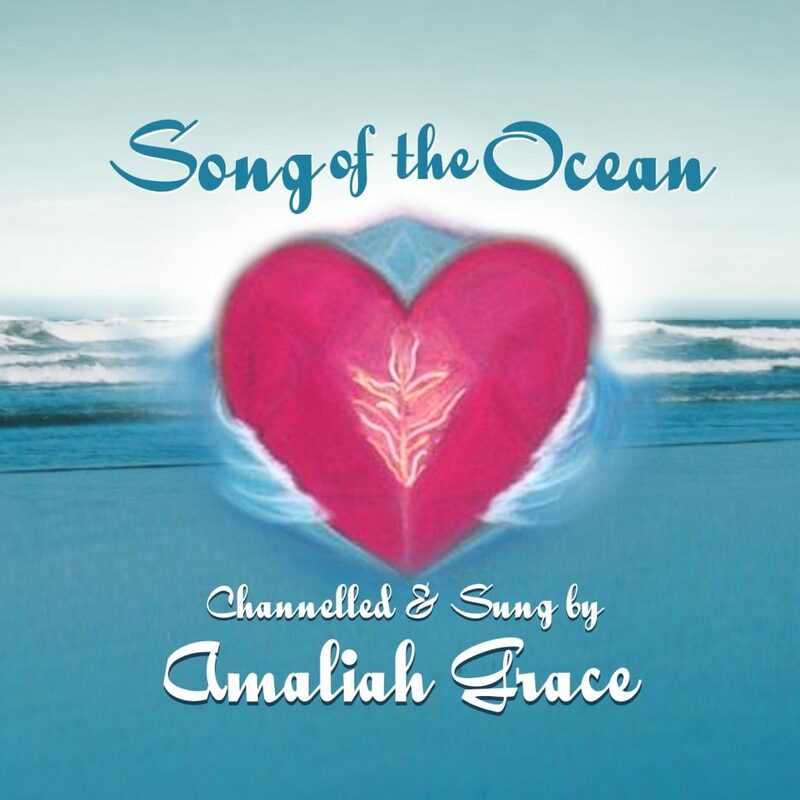 One of Amaliah’s gifts is her connection to Soul. She has access to the Akasha and channels in personal Soul Signatures as Sound codes of light and Glyphs as a 3D gold artwork. It is with a great sense of sacredness that I connect and channel your individual and unique Soul Signature. When a person receives their Soul Signature they literally begin to resonate at a cellular level with the higher vibration of their truth and the lower vibrational sounds incorporated into the human experience and physical body begin to dissipate. A new kind of harmony is created that is clearer more centered and most importantly the silence is greater. 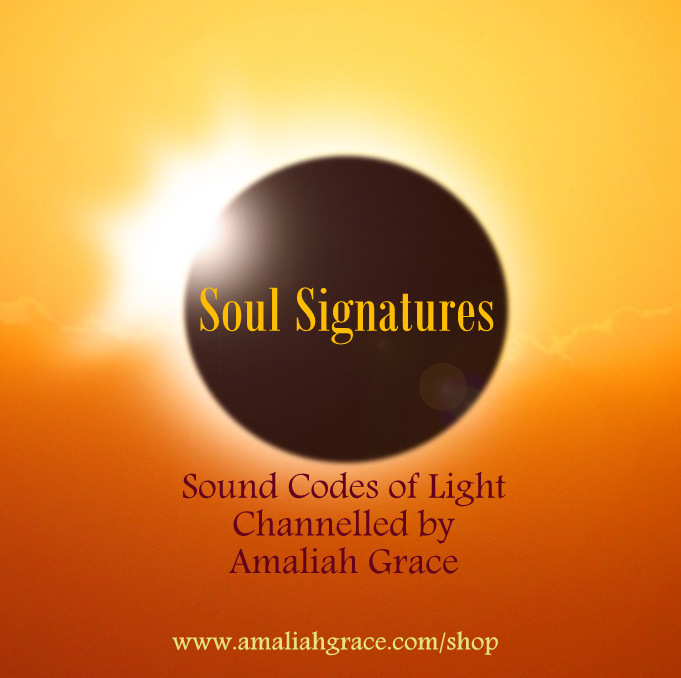 Below is an example of a Soul Signature Sound Code. 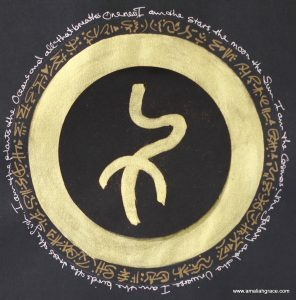 Soul Glyph is a channelled artwork, a Golden 3Dimensional expression and representation of your Soul’s signature. Symbols and Glyphs each emanate subtle sound waves at a very high frequency. Sounds of Resonance come forth on different frequencies, which can be heard clairaudiently. Some people can feel the resonant frequency whilst others can hear the high pitch sound resonance of each Glyph or Symbol through their clairaudient gift. They resonate with the vibration of your Soul’s Signature. They can be meditated upon or created into a piece of jewellery to be worn. Sitting with or wearing the Soul Glyph may activate dormant codes of cellular memory to awaken latent soul gifts and talents from times of enlightenment and alignment with ONE. These glyphs are the gifts you carry from the Soul in service to humanity. A meditation series to expand, evolve and trigger the dormant talents within your DNA and soul’S memory, illuminating the fullness of your Being. 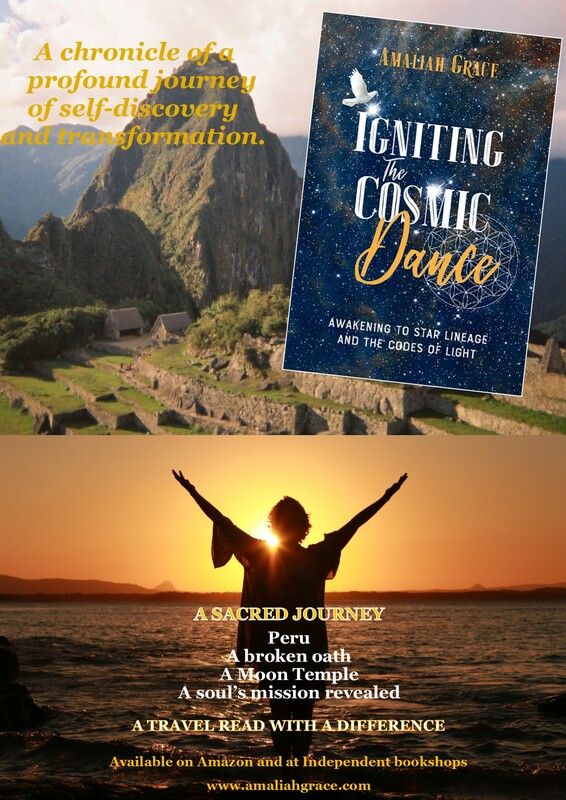 This program consists of nine Art codes and nine sound codes to be experienced in a progressive sequential program Series A, B & C. A delightful experience in self-expansion and ONENESS. 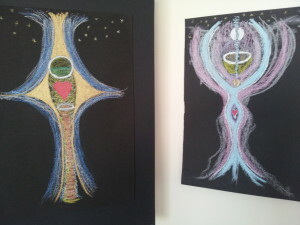 Amaliah’s Accelerator Art contains the language of light as codes of golden light. Created for each person to assist forward movement and change on their journey and accelerate their journey. Created on black paper with soft coloured pastels, gold and silver paint with light and love for your evolution. Channelled by Amaliah Grace from the Sirian and Arcturian Beings of Light. The next step in your evolution. These are artworks in Pastel and gold and silver paint containing Light Language Codes of Light which trigger and activate the next codes for your personal evolutionary journey. Every time you view your personal artwork, the codes of light will be triggered to bring forward and acceleration for you within your day to assist a forward momentum of change. New work initiated during the two eclipses and the Cardinal Grand Cross Planetary Alignment during April 2014. An energetic expression of a child or adults Guardian Angel. 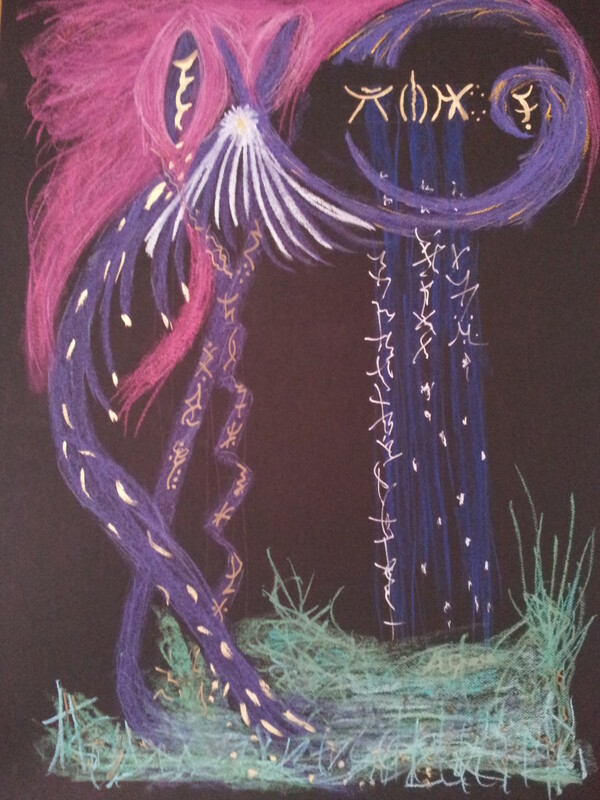 Wonderful to use as a SLEEP ANGEL to dispell fearful dreams and create trust in the Angelic Realm.